CRISIS IS compiled and issued by tony Jasper. Material is welcome, but there is no monetary reward - alas. this on-line magazine does not generate any income. Advertising rates are available. All enquires to tony.jasper@btinternet.com. CRISIS offers a broad spectrum, and at base reflects an aware Christian voice on news and culture; however good copy from any source is always acceptable if it offers reflection on the human condition. Says the legendary Mavis Staples: “I want to stop making people cry. I’ve been making people cry all my life.” So welcome to an upbeat set of lyrics. Mavis Staples is one of the great names of blues and gospel. For many she is associated with the US gospel outfit of times past The Staple Singers. Her father’s group found fame in a roundabout way when The Rolling Stones took away into their way of doing things, the gospelling song ‘This can be the Last Time,’ that was associated with the Staples. It was during those early days when the Stones had a profound respect for gospel and built up a fair little catalogue of recordings of this genre, as they and other British bands of the mid-1960s,and later, plundered the US black R&B world, as indeed of course so to the early Beatles. During the last few years she has found herself young contemporary producers and so found a new recording and career life. Her latest album, the fifteenth solo outing, bears the title Livin’ On A High Note (Anti) and sees involvement with contemporary music hero M.Ward, himself into his eighth album with More Rain. Ward likes things spare, no fancy arrangements, all rightly is directed to colour her vocal phrasing and that is so true. He’s one of those who makes it seem so easy but as many know to do this you have to be round for a long time unless your name is Marcus Rashford, the eighteen year old new gem on the football field. Ward’s embellishments are subtle, just hear what he does in the track Dedicated.’ Here she vocalises with authority, firmly planting herself on to whatever song is there before her. Yes, blues here, yes gospel inflections, and on a track such as ‘Tomorrow’ she almost raps. It’s majestic stuff. She is one of the music heroes of the protest racial justice music fraternity, and memories of this are never far away. That said on this album she takes her listeners into the wider world where people lose their lives in endless conflicts so that others can live – on this track ‘History Now’ she is joined by Danny Gerrard and here, as elsewhere there is a almost murmuring gospelling sounding back-up choir. Great track. Nick Cave is one of recent music’s greats (OK, he still makes great albums) and she sings his beautiful song ‘Jesus, Lay Down Beside Me,’ She gets acoustic guitar for the final cut MLK Song that tells of her hope that she has spoken about Jesus where it matters, a life in part seen in giving to others; that she has walked for the hungry, marched for peace, sung of salvation, and obeyed the calling of the Master – “then life will not have been in vain” . So get your skates on and buy this just under forty minute running album. L Well, where have I put it, here it is. I am so excited. You will love it, I know you will. L Don’t be silly, it’s not just an envelope. Open it. L: payment down on that special suit you wanted. A season ticket for Arsenal. T: That would be exciting. So what does it say. I’m waiting. : thank you for switching your energy supplier. Do you know it said consumers are paying 1.2 billion more than they should. T oh this came in the post, sorry put inside my jacket. HERE. L Dear Madame, thank you for switching your valued custom. You can rest assured we have your interests at heart; we value transparency. instant call out, safety in your home, something so vital to our senior citizens.. All you pay is for the various ‘parts’ that may be necessary, and a small surcharge if the ‘call out’ is between 6 p.m. and 8 a.m. The all-day freedom to know instant attention is yours means peace of mind. We know you will understand that prices have to increase – So there is small price rise of 20% to bring us in line with other providors and will be from the second week in September. It is of course not something we have done. Copyright`- tony jasper. You are welcome to use but do state the source. 1 What is his real name? 3 What year saw Cliff make his first attempt to capture the US market? 4 What club did the early Cliff play and visit in London’s Soho? 5 At which studio did Cliff and the Drifters record their debut disc? 6 The Daily Mirror had a nickname for Cliff, and it focussed one part of his body, so what was ti? 8 His backing group had to change their name. Why? 9 Who was his co-star in Wonderful Life? 10 On his second album he sang Blue Suede Shoes. Which famous US artist had a big hit with it. 11 Cliff eventually had a long time manager after early times with a number of them. 12 Cliff said he had become a Christian and he said this during a religious meeting. Who was the famous US evangelist at that gathering? 13 Cliff has given much time over the years to which Christian charity? 15 Cliff sang on the tenth anniversary of another great pop TV show – YLS. Translate! 16 Name then panto that starred Cliff and his group in 1959? 17 Cliff went back to school and in 1974 he played in a school production of a Shakespearian play. Name it. 18 Anthony Quayle and Sarah Churchill were in which film, alongside the man of course! 19 Name the B-side of his second single High Class Baby..
20 Which music paper gave him his first major award as the Best New Singer? 19 My feet hit the ground 20 NME. What though next in a seeming move these days to make us feel solcomfortable and not be upset? I would ban all football because watching a game makes me unhappy as I remember that once I could run and run (sort of0: I would stop young people driving sports cars because it makes me feel sad that I cannot ride local roads waving at adoring girls (at the car that is). I would ban all-night raves because they make me unhappy that I cannot any longer linger long into the night, And so on, and so on.. Inside the Dream Palace - Sheill Tippins (Simon &Schuster). PIck up at HMV for just £3.99.b ells in a` fascinating ay the life and times of New York’s legendary Chelsea hotel. A God in Ruins – Kate Atkinson(Black Swan). Addictive writing. 0 Sing unto the Lord – Andrew Gant (Profile) . Sumptuous guide to the history of English church music. Republican theology - Bnjamin T. Lynerd (Oxford0. Must read with Trump saying he is a Christian. We’re Heaven Bound – Gregory D Coleman (University of Georgia) Been out some time but re-appearing as it were, tells of a folk drama in the black community. In early January I was in Swanwick at the Conference of Christians Aware doing a concert. A friend of mine, Aziz Nour, came up and asked if he could talk to me afterwards. 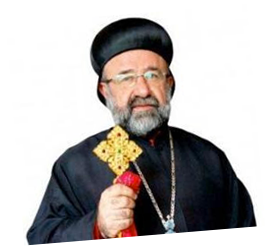 Aziz is an Iraqi Christian from Mosul, a member of the Syrian Orthodox Church, and I had met him through the years at various events and particularly when we were both on the board of Living Stones of the Holy Land Trust. On this occasion Aziz wanted to talk to me about a personal friend of his, the Syrian Orthodox Archbishop of Aleppo, who was kidnapped three years ago. Aziz spoke about the Syrian Orthodox Church whose members are in Iraq and Syria, and told me about the kidnapping of his friend, Mar Gregorios Yohanna Ibrahim. I had heard that two Archbishops had been kidnapped three years ago, but knew very little of the details. Aziz explained to me that Mar Gregorios had been going with Archbishop Paul Yazigi to try to buy the freedom of two of their priests. Aziz was with him the morning they left and indeed asked him not to go as he felt it was unwise - but the Archbishop felt that he must work for the release of his priests. Since then nothing has been heard about the Archbishops or the priests. People believe they are still alive because they could be exchanged for large sums of money. Aziz is pretty sure that they are with either ISIS or the Al-Nusra Front. In either case, that is an alarming thought. Aziz has put together a book of comments from Christian leaders around the world, particularly those who knew Mar Gregorios, and he asked me if I would write a song about him for inclusion in the book. I was hesitant at first as it seemed quite a big task and difficult to get it right. Aziz wanted it to be a song where people would be able to sing the chorus like in others of my songs. Thinking about it and getting material from Aziz made me more and more conscious of our sisters and brothers who come from such ancient churches. Churches that even use the Aramaic language in their liturgies - the very language that Jesus spoke. Several times when leading Holy Land pilgrimages I’ve taken groups to the Syrian Orthodox Church of St Mark in Jerusalem, where an Iraqi nun has spoken to us. I’ve been moved by the stories she tells. There’s a painting there, of an icon, that she says was made by St Luke. Whether that's true or not I don’t know, but you can feel a strong sense of history and a Christian tradition that we know all too little about. The nun finishes off her talk with some words that I particularly like - she says, “Let’s go downstairs to the Upper Room”. There are a few candidates for the Upper Room in Jerusalem, and this is one of them. The buildings all around now means that this one is to be reached by going down from the church. There she prays the Lord's Prayer in Aramaic - the very language Jesus spoke - it is a very moving and special moment. I remember when Elias Chacour first came to Greenbelt he spoke about the meaning of the Aramaic in the Sermon on the Mount. I was next to a Bishop who said, "Nonsense, no one knows Aramaic - it is no longer spoken." But these ancient churches have an ancient history and some even use Aramaic in their liturgy. We have much to learn from them. If you want to read a book which gives an insight into the Christians of the Middle East, William Dalrymple’s book, "On the Holy Mountain" is both highly informative and also deeply moving. In it he meets Mar Gregarious and they have a great encounter when Mar Gregorios explains to William that they are going to have a Stylite in their Cathedral (a monk who stands on a pillar). It’s both genuinely funny, and yet brings out the tremendous sense of history that is present in the Middle Eastern churches. I had to write the song quickly in order to meet the deadline for the book. As I read the words of different people talking about the Archbishop, I felt I caught a glimpse of him. And I often felt moved and lit candles and prayed for these captives. Then I had to record the song as soon as possible; I was down in Braunton in North Devon for a weekend where I discovered that the vicar of the parish church in Georgeham, Mike Newbon, had been Studio Manager of ICC studios in Eastbourne for many years and now had his own small studio in his house. So I went and recorded the song there. My daughter-in-law, Eils, is a great vocalist and I asked if she would help with the backing vocals, and she did a fantastic job. We then brought in her three children - my grandchildren Harley, Caitlin and Aisha, and they also sang beautifully, and I think bring the song to a very good conclusion. Mike added some bass and Nashville High Strung Guitar. 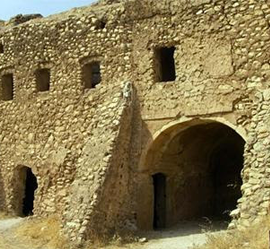 Also ISIS have destroyed Iraq’s oldest Christian monastery, as ISIS tries to eradicate the traces of Christianity from the region - the monastery had been there for nearly 1500 years. Come home Mar Gregorios - we wait and pray for you. Mar Gregorios, Lord hear our cry. Come home Mar Gregorios – let’s roll that stone away. Come home Mar Gregorios – bring them all with you. so that you will live deep within your heart. so that you will work for justice, equity and peace. so the you will do the things which others tell you cannot be done.